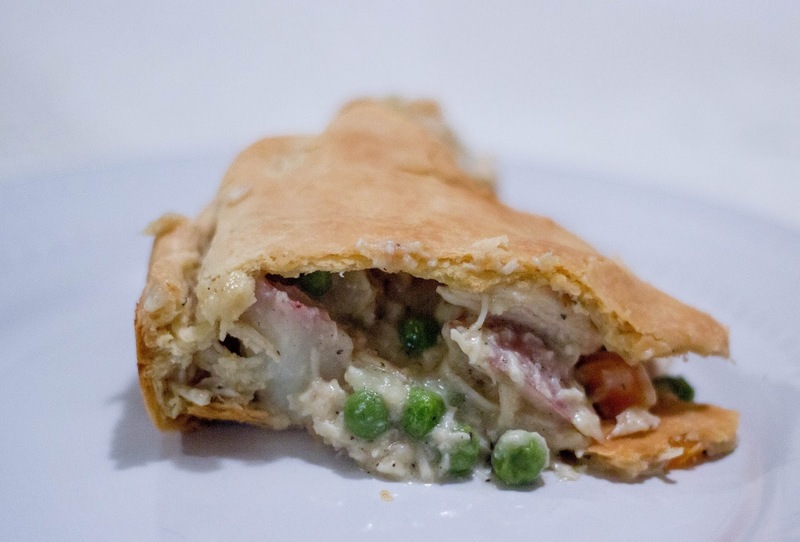 Tasty Tuesday: Chicken Pot Pie | For the Joy of Life. Are you guys as shocked as I am that I'm actually posting a recipe?? Geez I was doing soo good with Tasty Tuesday recipes then pregnancy happened and I was sick all the time... haha. But food actually sounds good again, I have a little more energy, and I've actually missed this! Sooo I decided to re-start this off with one of my most frequently asked about recipes, Chicken Pot Pie! 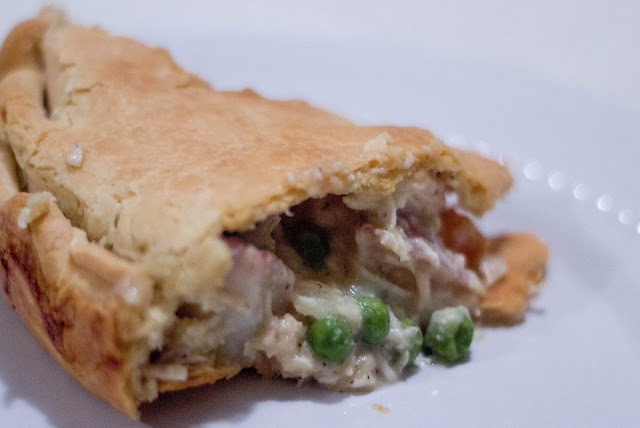 I absolutely hated chicken pot pie growing up. I only ever tried the gross frozen ones that basically have McDonald's chicken in them... gross. And I mean, I think it tastes pretty darn good haha. 1)Preheat your oven to 400. Then I always start by boiling two pots of water for the chicken and potatoes. Once it's boiling I cook til potatoes are tender (cube before adding to water to cook faster. I do the potatoes in sixths or eighths depending on size) and chicken is no longer pink inside. 2) Set the potatoes aside and now add your frozen peas and carrots plus diced onion to the water to flash cook. (meaning don't overdue it and make them soggy... strain as soon as they are warm) In the meantime shred your chicken. Use a kitchenaid, it'll change your life. Set chicken aside. 3) In the now empty pot your chicken was in, melt down the butter. Once it's melted down, quickly add your flour to make a roux. Slowly add your whipping cream and broth whisking while doing so. After that I add in the cream of chicken and whisk it in. I don't always use the full can, most of the time just 3/4. Add your spices in now as well. I do about a 1/2 tsp of each. Bring to a boil for two minutes to thicken. Then turn the heat to low and add you shredded chicken, potatoes, and veggies. Stir and let simmer. 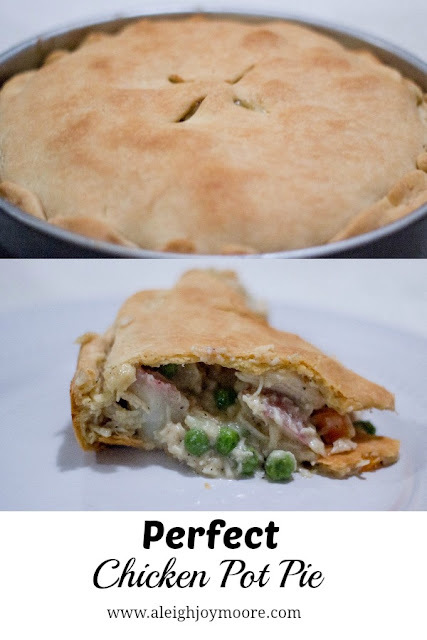 4) Place your first pice of crust in a pie dish and then pour your mixture on top of it. Add your top crust and pinch the edges to seal the deal. Cut a few slits at the top for ventilation. 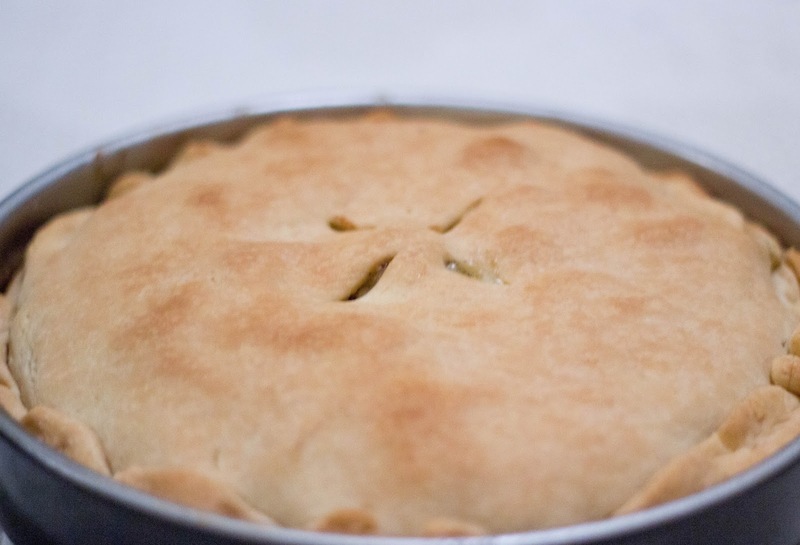 5) Bake for 40 minutes or until top crust is golden brown. This meal will feed us for a few days because of how filling it is.